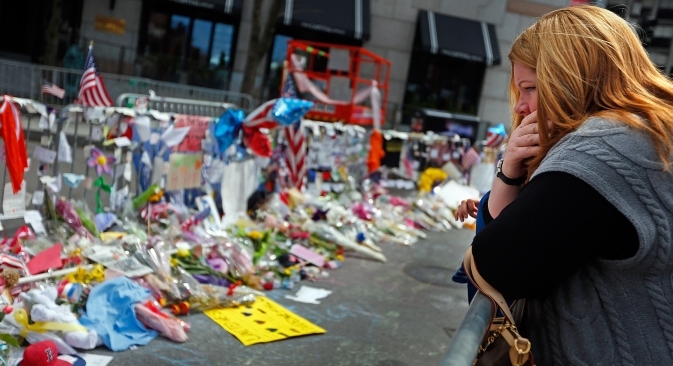 With Russian President Vladimir Putin's calls for an intensification of joint efforts between the United States and Russia in their anti-terror campaign in the aftermath of the Boston Marathon explosions, experts outline the “hidden obstacles” that may hamper this initiative. Russian President Vladimir Putin’s statement about the Boston Marathon explosions sparked debates among Russia’s pundits. While some experts believe that the U.S. and Russia will step up their joint campaign against international terrorism, others warn against “hidden obstacles” that may prevent the countries from initiating a dialogue. When asked about the growing anti-Russian sentiment in the U.S. sparked by fact that the Boston blast was orchestrated by terrorists with Chechen origins, Russian President Vladimir Putin called for more extensive anti-terror collaboration between the U.S. and Russia during his televised session with Russians. “This tragedy should draw us closer in the suppression of joint threats, among which, the most dangerous, is terrorism,” he said. Putin also added that Russia and the U.S. should step up their collaboration in their fight against terrorism instead of sparking tensions in their bilateral relations. This statement made experts speculate about the possibility of such collaboration. Evgeny Minchenko, Director of International Institute for Political Expertise, argues that Putin is offended by the fact that his previous attempts to involve the U.S. in a joint anti-terror campaign fell short after the September 11 attack. In his opinion, Russia's offer for collaboration wasn't met with a significant response and interest from the then-U.S. President George Bush Jr.
“Putin’s initiative [to fight terrorism with the U.S.] turned out to be ‘a one-way traffic street’,” Minchenko said meaning that, eventually, Putin failed to see eye-to-eye with his American counterparts. “While Russia did utmost to support America – for example, by allowing cargo transit to Afghanistan through its territory, the U.S. continued to conduct the NATO expansion policy and backed anti-Russian sentiments in Georgia [in the wake of the Russo-Georgian conflict],” Minchenko said. That may be the reason why Putin was so blunt while talking about the Boston explosion, according to him. Nevertheless, the expert expressed his hope for a strengthened collaboration in a joint anti-terror campaign. “Yet there are hardly likely be any dramatic breakthrough in this field,” he added. Other experts seem to be more optimistic about U.S.-Russia anti-terror campaign. “Russia and the U.S. have been collaborating in this field for a long time,” he said. “What Putin wants to show is that we will continue to work together regardless of differences,” he said. Political pundit Stanislav Radkevich echoes Chizhov. He believes that Russia and the U.S. “are doomed to establish a close collaboration” after the Boston Marathon terror attack. Meanwhile, Dmitry Orlov, head of Agency for Political and Economic Communication, warns against some “hidden obstacles” that may hamper efforts to establish dialogue between two countries. Although Putin delivered an unambiguous message to the U.S. that Russia is ready to step up the joint anti-terror campaign, he hasn’t yet forgotten some thorny issues in bilateral relations, Orlov said. Interference in domestic policy such as human rights issues, the Magnitsky Act and inability to recognize national interests of a partner - all this may fuel U.S.-Russia tensions, according to Orlov. “The geopolitical agenda can be expanded from international terrorism to other global challenges such as the North Korea standoff, the Syrian crisis, ABMs,” he said. The political expert pins hopes on the next meeting between Putn and U.S. President Barack Obama scheduled on September during the G20 summit.